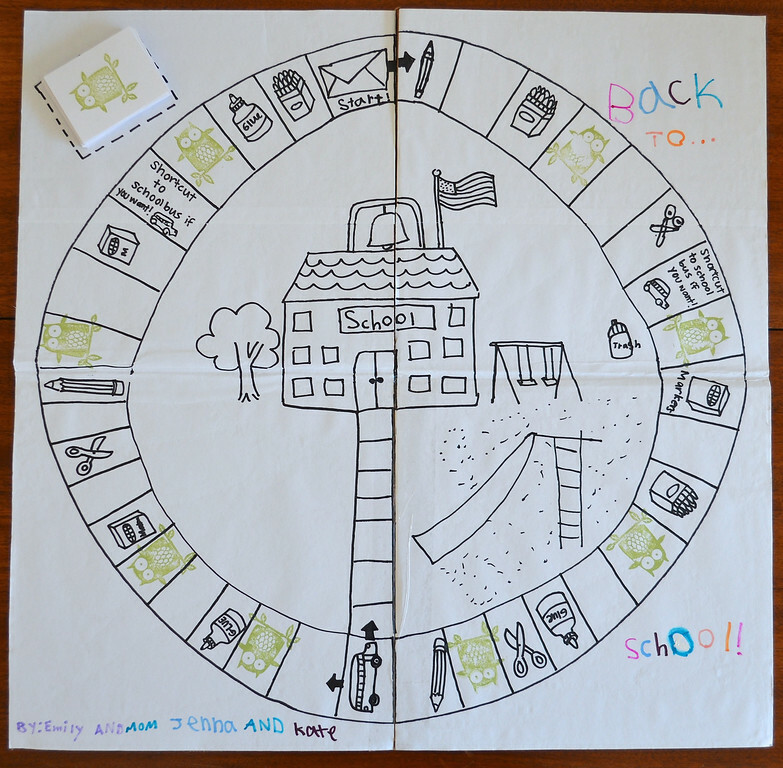 Emily's vacation assignment was to make a board game she could play with her class in some kind of GameFest. Making the game wasn't a mandatory thing, said the teacher's note - more of "an extra challenge" if the kids wanted to do it. When I raised my eyebrow at the likelihood of 7-year-olds independently designing and executing a workable (the keyword here being "workable") board game, Emily assured me that parents were allowed to help and asked me, therefore, to pleeeeeeeeeeaaaase help. So we spent the day making it and everyone helped. 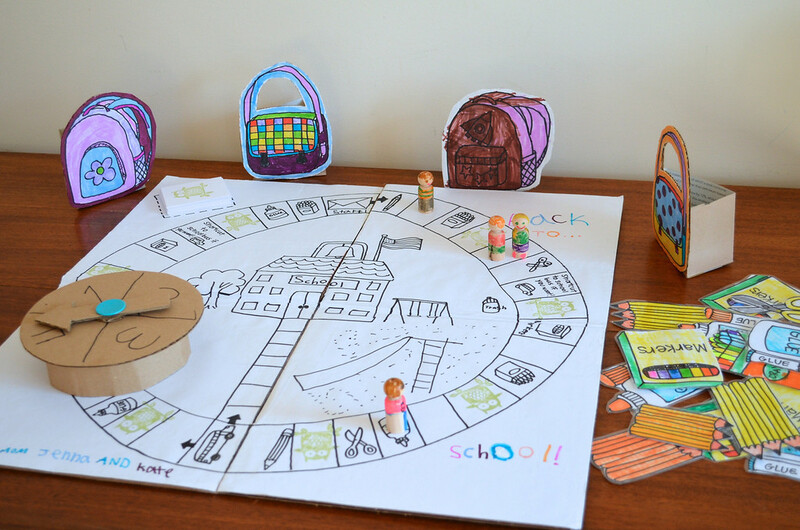 She designed her game based on the many board games she'd seen and played. My job was to steer her ideas towards functional elements and perform all the dangerous stunts required to render them in cardboard. 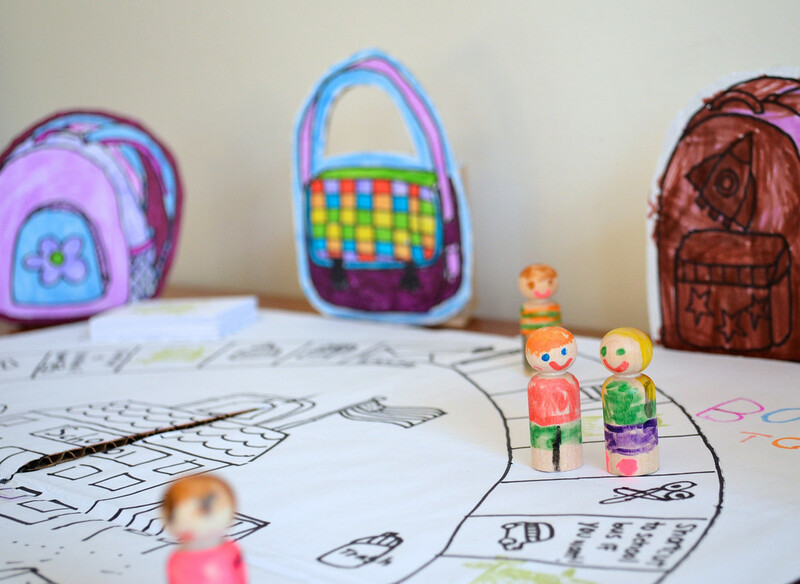 If your kids are at the age when they enjoy board games, it might be fun to make your own. 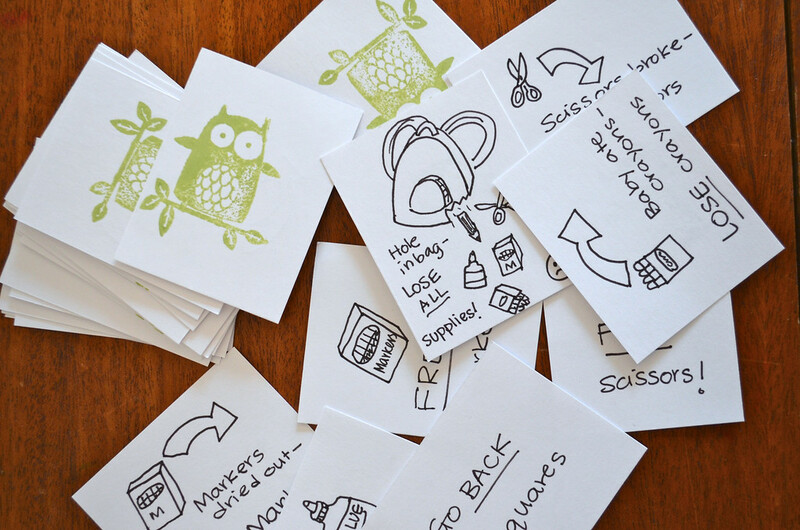 So we documented our process to provide a crude formula for designing a workable board game. All you need to do is pick a theme and change the details to fit that theme. Enjoy! First, we had to find a box. It was more difficult than you'd imagine, finding the right-sized box. and devise a way to fasten it. 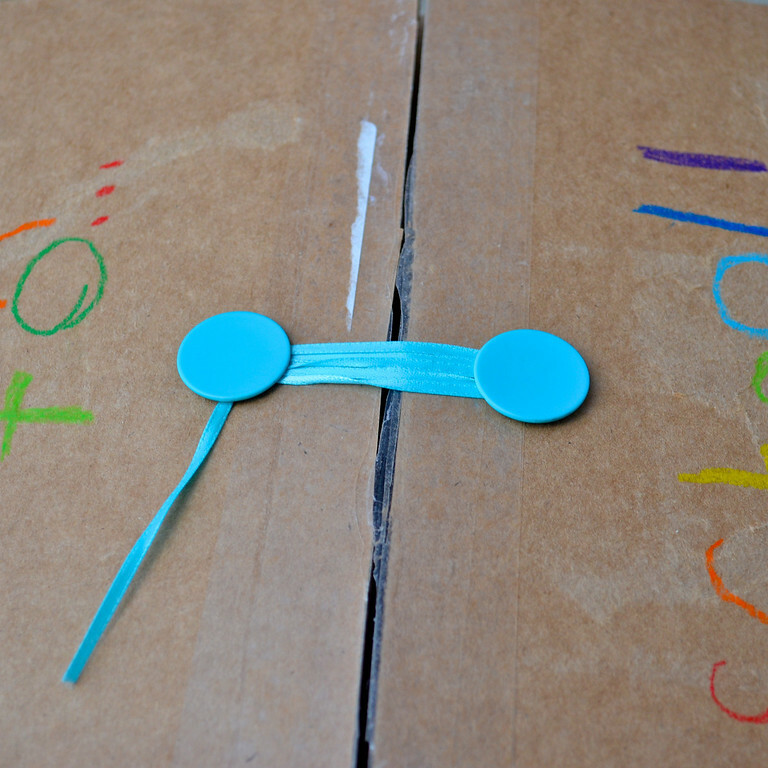 For these, we used these round blue Makedo fasteners. 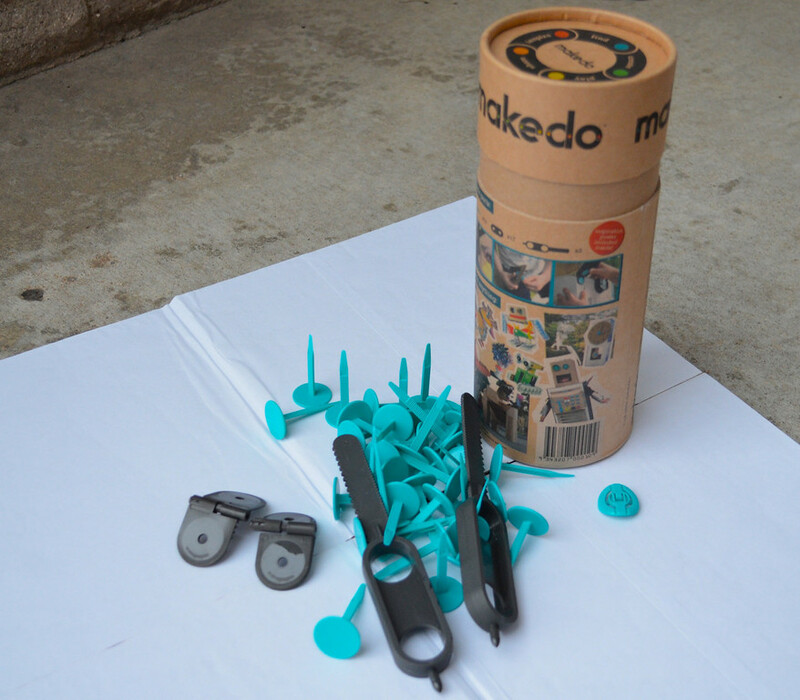 The folks at Makedo replenished last year's supply with a fresh batch with newly-improved parts! 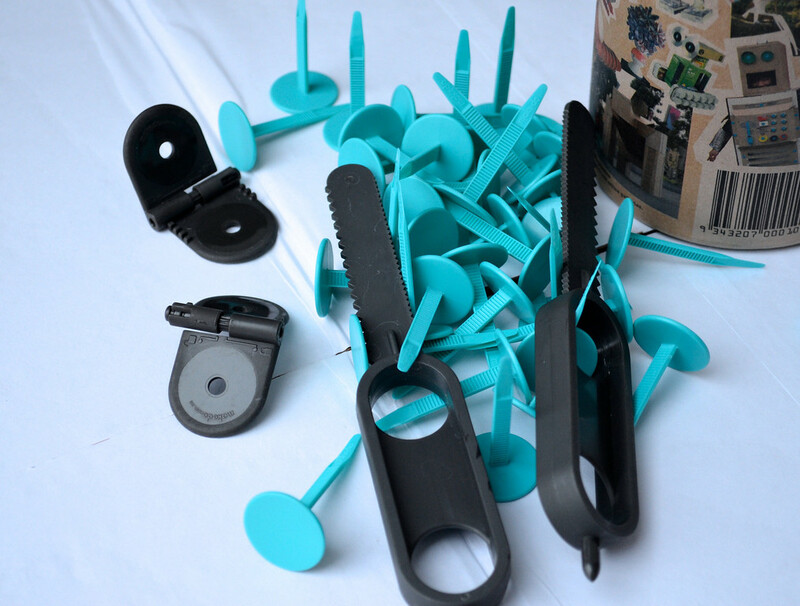 The saws and fasteners are the same, but the old hinges (which used to only lock or click into different angles) now swing free and also click into different angles. This opens up new possibilities for gates and doors and all sorts of free-moving stuff. Moving along now, the next thing we made was a spinner. 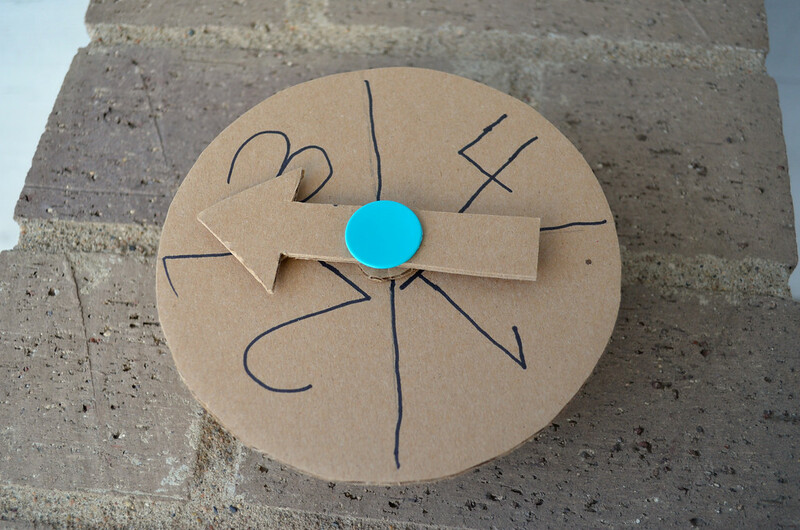 A board game is only as good as its die or spinner, we felt, so we made sure ours was a good one. Note the little cardboard washer in the left picture below - it allows the spinning arrow to move freely without touching the dial surface - this is essential for awesome spinning. 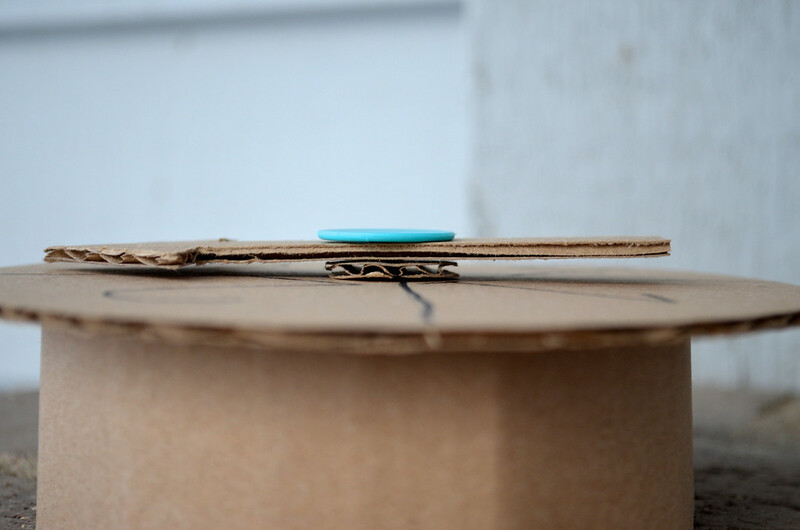 The picture on the right shows the reason we needed the cardboard collar - the protruding end of the fastener. Turns out that this design improved the stability of the entire spinner - it doesn't need to be held down when spun. Bonus! 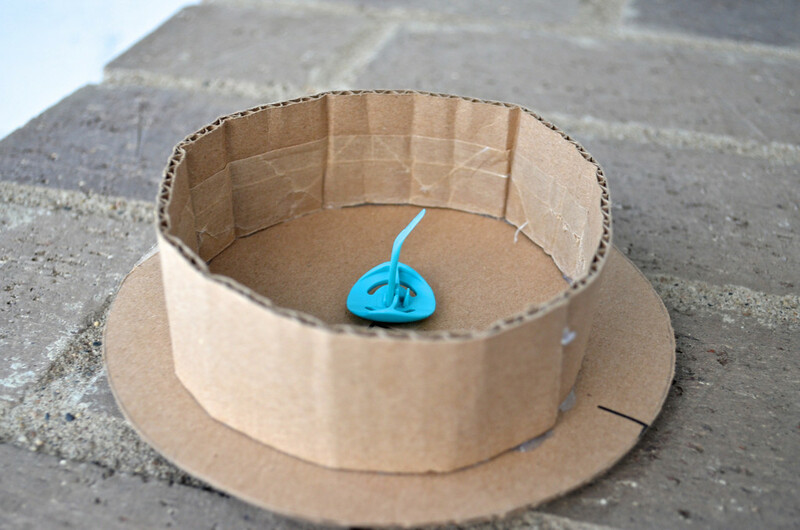 Obviously, if you don't have Makedo parts, you can use paper fasteners or a bolt and nut. After this, we made the board. Ours folded twice into quarters. 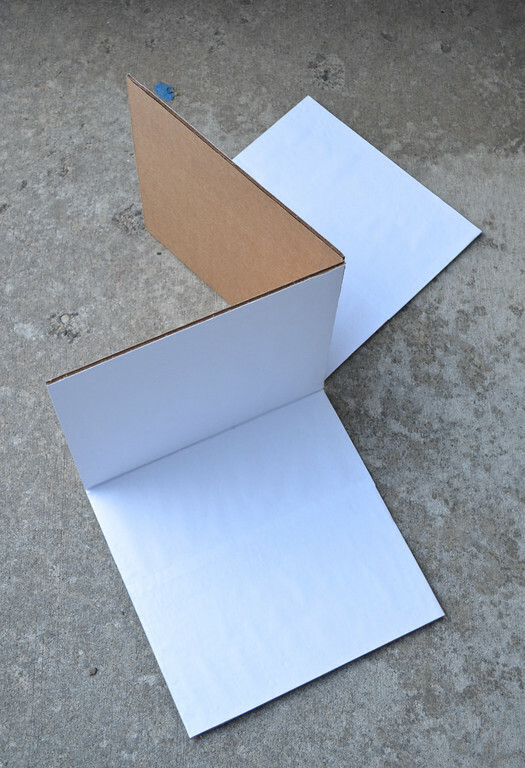 It was made of two identical rectangles, taped halfway together so that half of that seam splits open to allow folding. 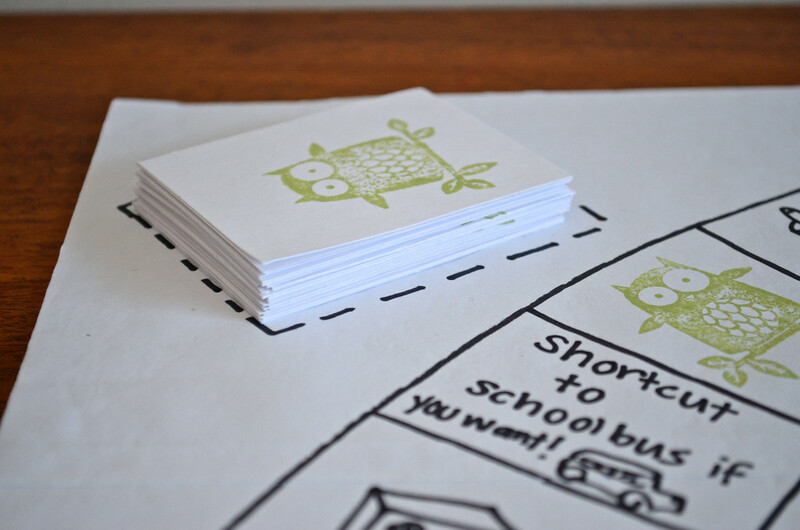 We glued white paper on the top surface because white is nicer to draw on than brown. With those basic elements - box, board, spinner - we were ready to add details to give the game a theme. Emily picked a school theme (no surprises there), so the object of the game was to collect school supplies and "get to" school. 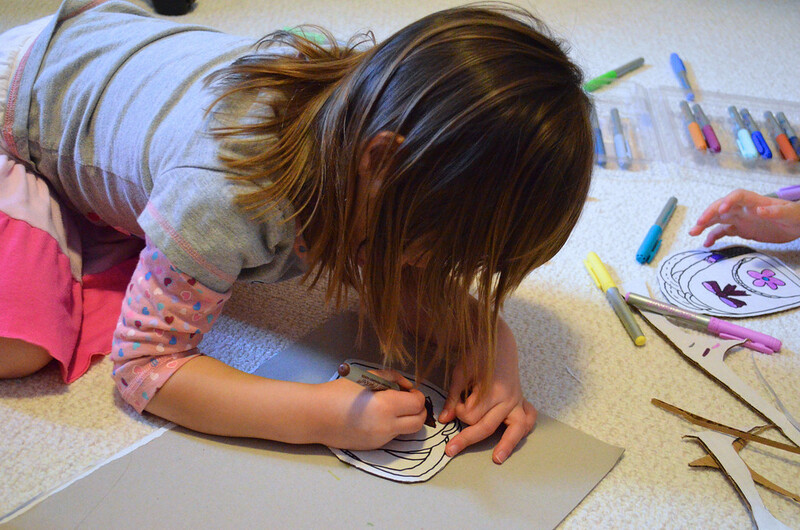 Emily furnished all the details and I simply followed her instructions and drew, cut and glued accordingly. 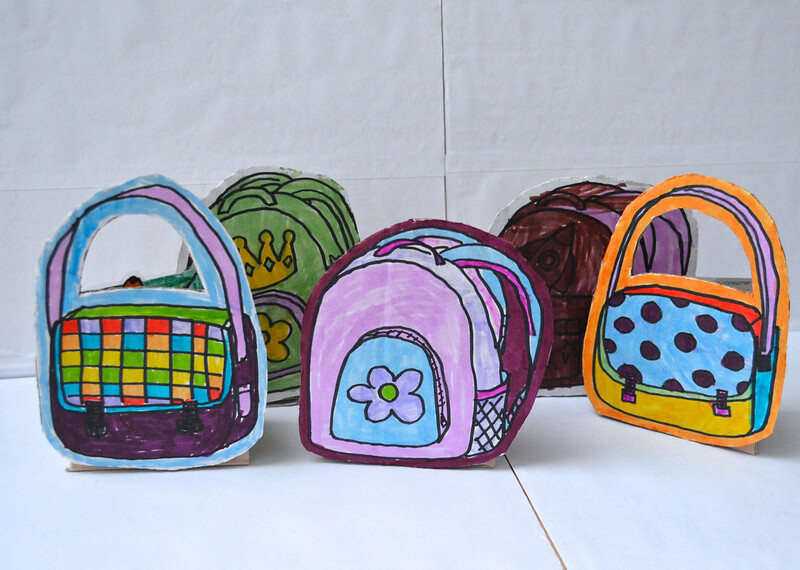 Then we made cardboard school bags ("two backpacks and two messenger bags, Mom"). We drew an extra one for Kate to color and keep. 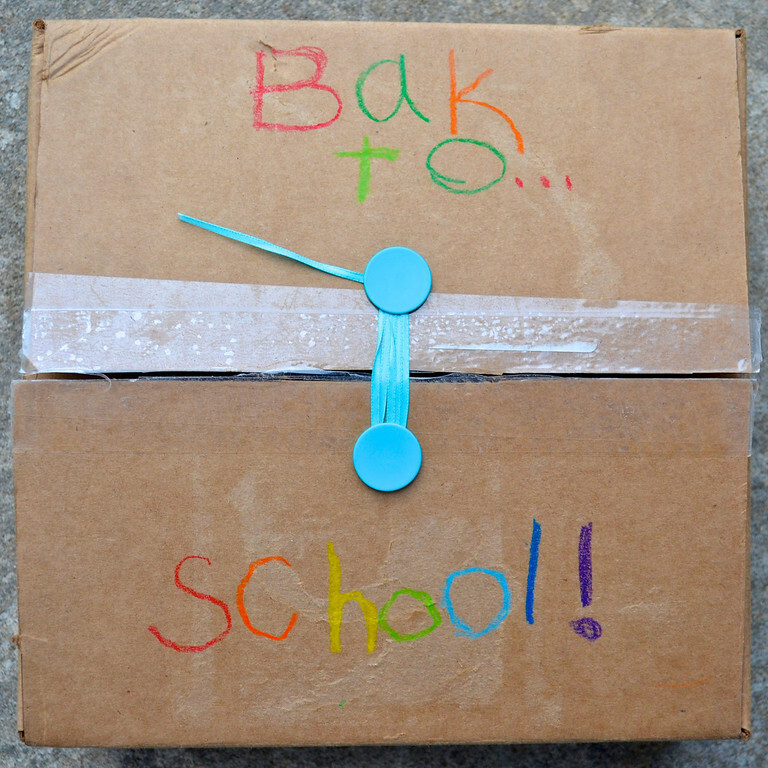 Each player has one of these to collect school supplies in. (and yes, that's Jenna dressed as a mermaid). 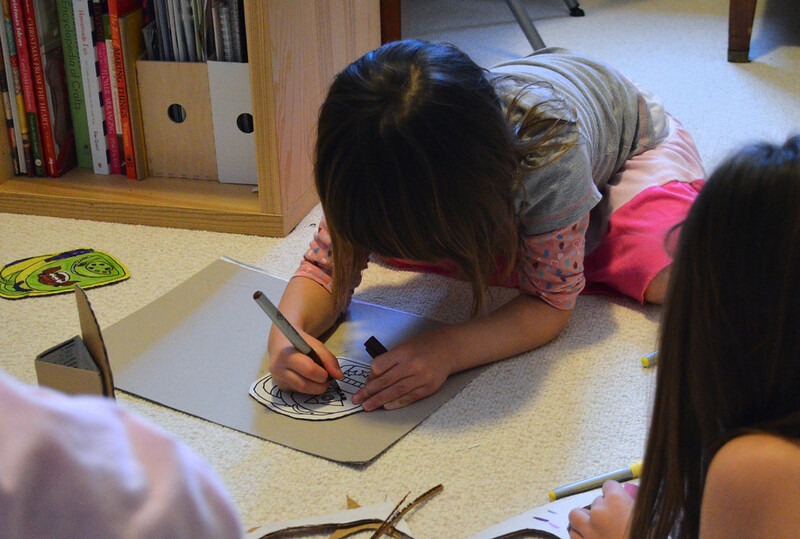 The girls are all trained to color on pieces of cardboard (on the carpet) or newspaper (on tables), especially if they are using permanent markers. Jenna sometimes forgets, though but Kate is particularly good at remembering. 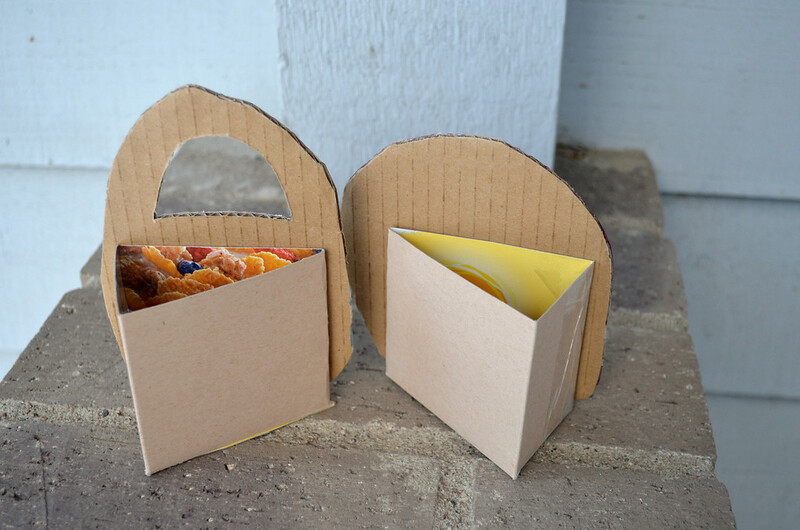 and glued the cardboard bag facades onto them. Obviously you don't have to make them triangular. 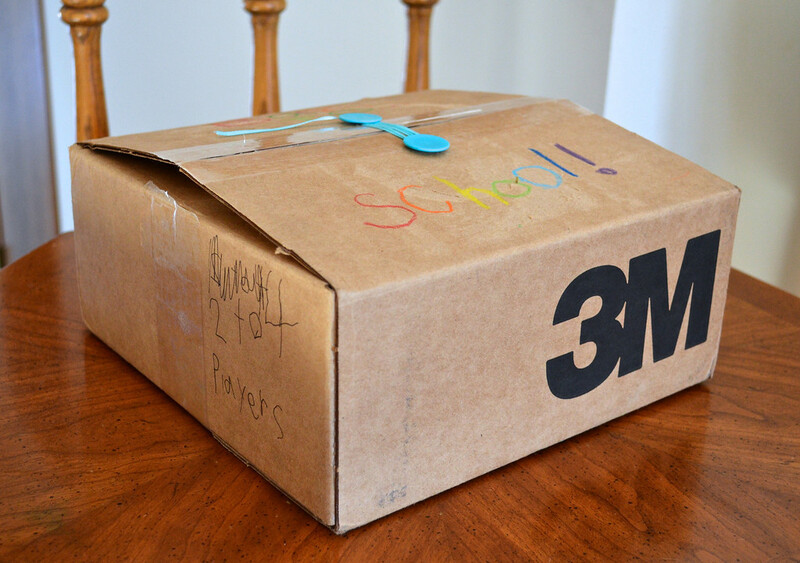 Most normal people would make them rectangular or use band-aid boxes. 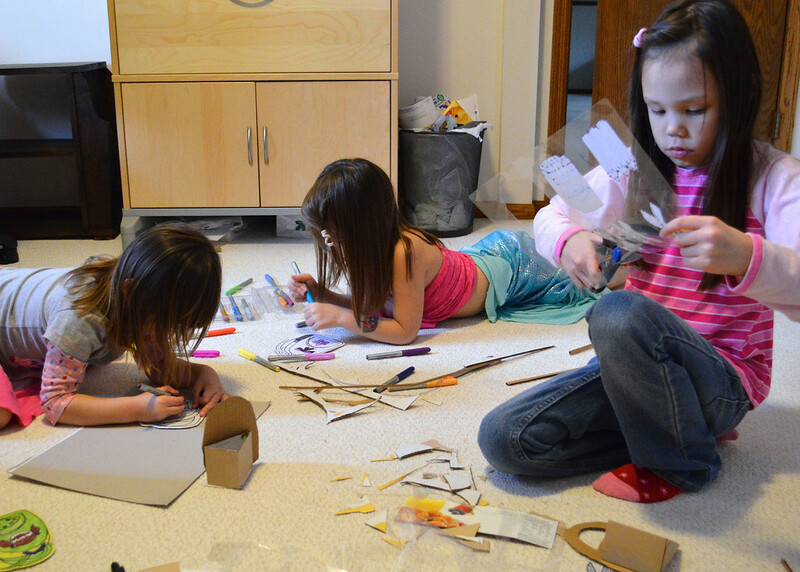 Our cardboard pieces were too small to be made into rectangles wide enough to hold the supplies. 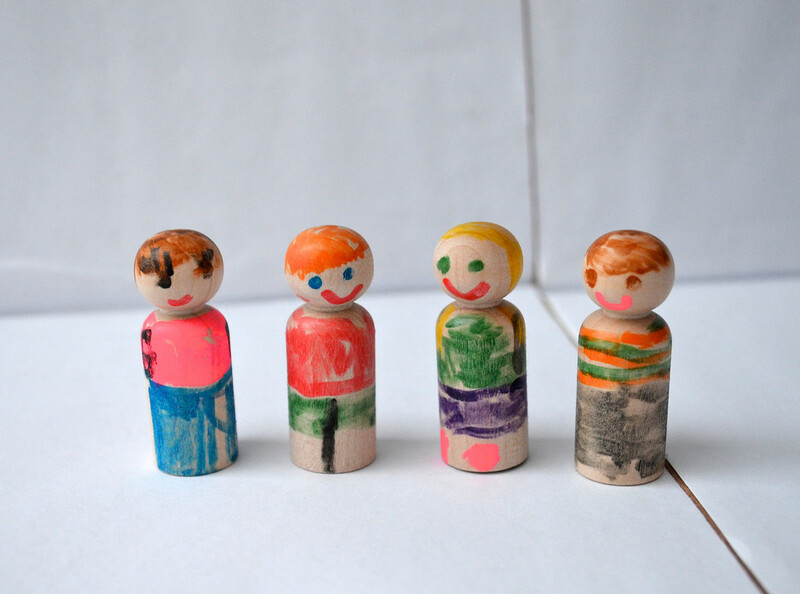 Emily made four peg people tokens. that offered a variety of helpful and frightening instructions on them. The last thing we made was an instruction sheet. And then we test-drove the game to refine it. We found that because the game circuit was so long, we needed a couple of shortcuts to the school bus square (from which players could, with full backpacks, get to school without having to go all the way around the board). Emily is very excited to bring her game to school tomorrow! P.S. Kate asked about the Barbie Castle again, today. I don't feel up to it, because of its size. We already have the Greengrocer shop that nobody wants to throw out and even I know there are only so many ginormous cardboard megastructures a person's house should host. Poor kids - who would've thought that their cardboard ambitions would be thwarted by their own mother?! Did you add an ugly dress players are forced to buy? Looks like a great game! But I bet even more fun than playing it was the making! Alas, no. I remember that dress!!!!!! Interestingly, I bought the girls Payday for Christmas - the new version, sadly. No dress either. The original version is going for gold nuggets on ebay. I hope Jess still has hers - she'll be rich if she ever wants to sell hers. 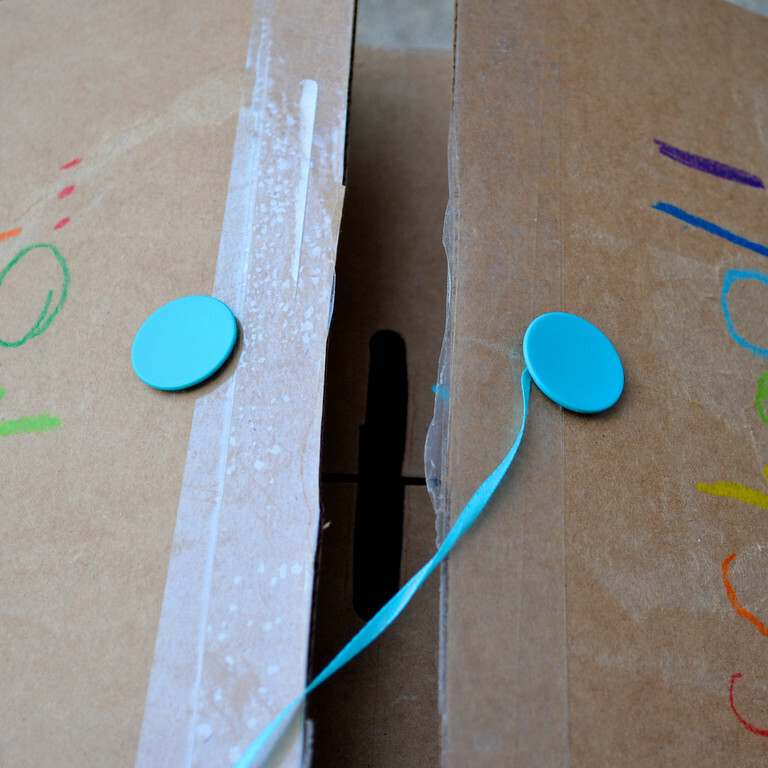 I think I love your cardboard creations even more than the sewing ones... Thank you for all and happy new year ! I love the game!!! 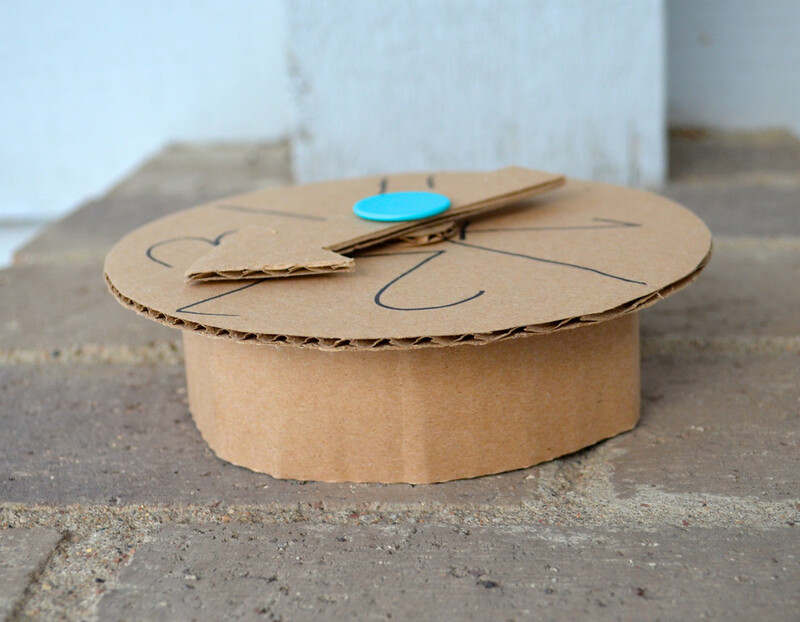 I need to remember that cardboard washer trick for spinners. I threw out our space shuttle today. Very sad, but our house is small and it took up a lot of space! 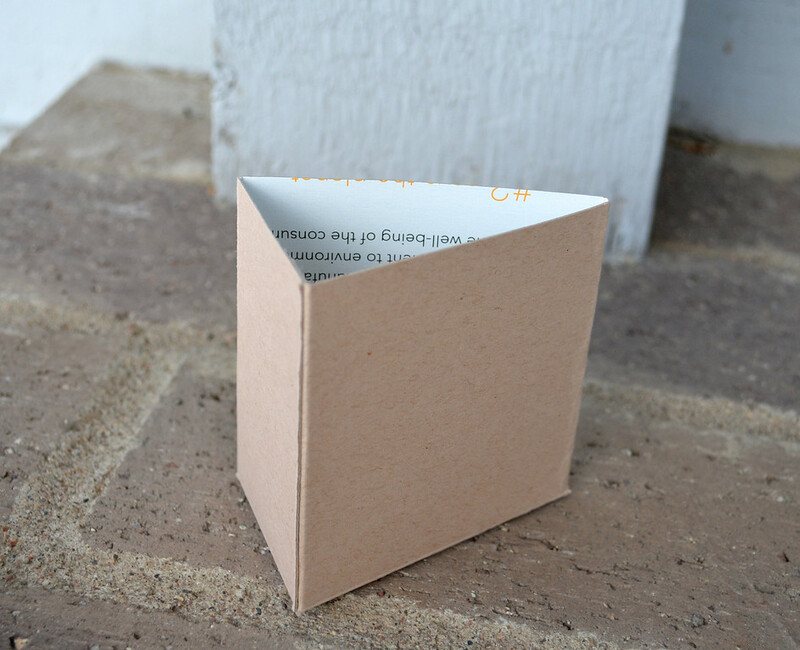 Technical question: what do you use to glue the white paper to the cardboard so nicely/non-wrinkly/completely? K: I used Elmer's!!! The white glue that everyone buys for school!! Let it dry well. And use construction paper, not regular printer paper. Such a lovely idea LiEr. My girls came up with their own game today and we made it. Unfortunately I can't draw like you can, but I found some clipart online, and then just traced them so they look less like clipart. Photocopied all the drawings, and away we went. Our version is Party Time. They have to collect cake, balloons, party bags, party hats, party games, etc. It's been a really fun afternoon of play. 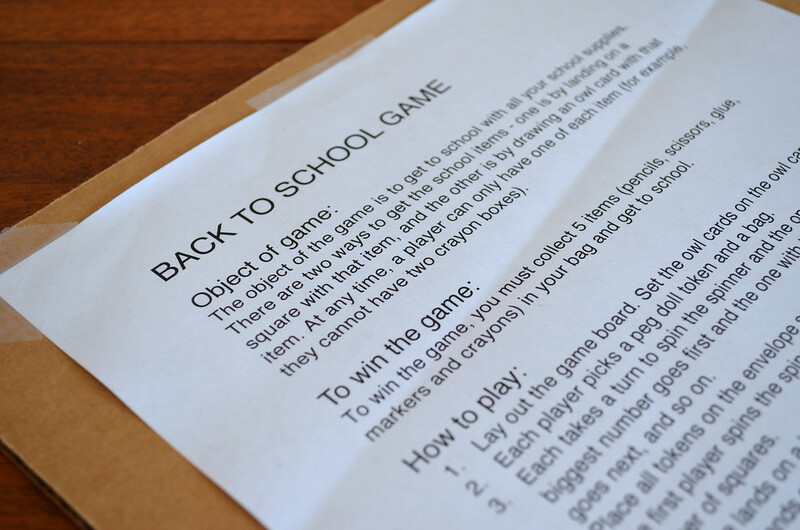 I was browsing the net on creating board games for my little English school and came across your blog. and... OMG this is SO neat! And the girls are so adorable! 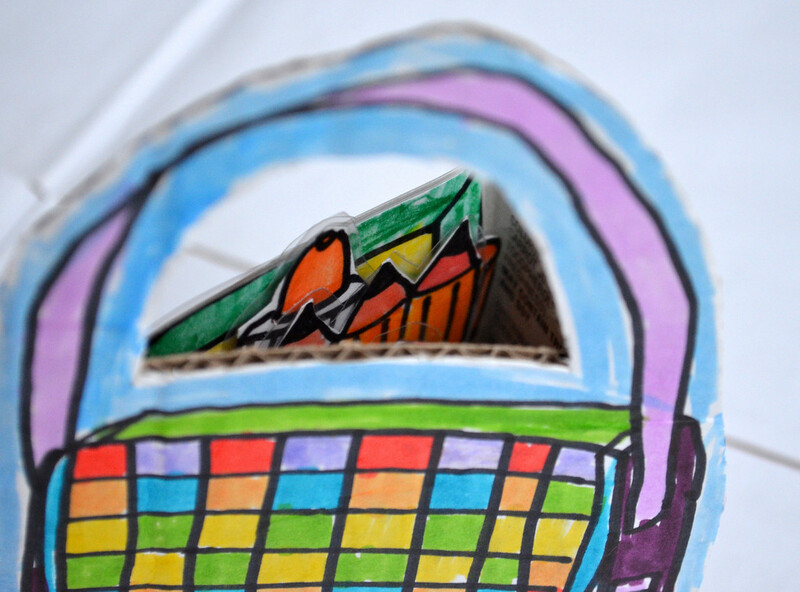 I totally love the bags and how you can put the collected items inside. A great inspiration. Thank you for sharing! 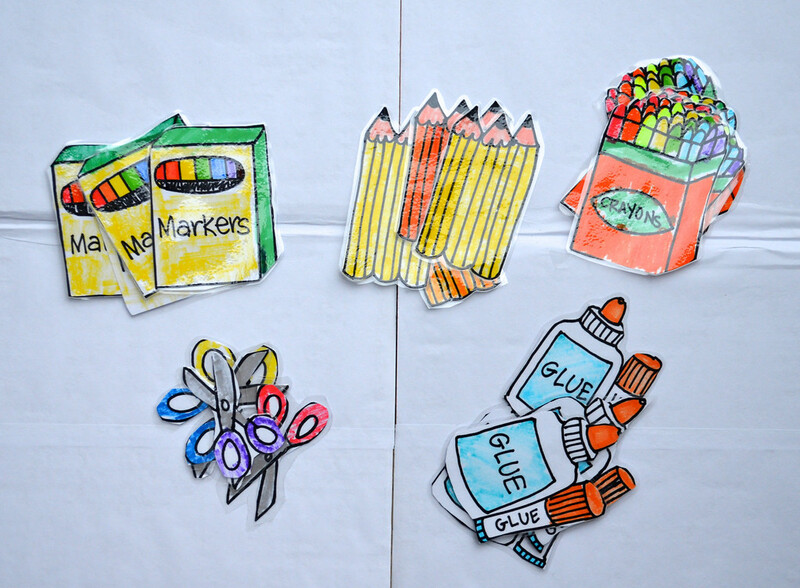 What material did you use for the peg people? A great project. Lovely ideas. Gave me a chance to make folding game board. Got to make a folding game board easily. Great project! Awesome helped me alot! Thanks!